Sh Interface – What Is It Good for? There are main principles and there are small technical details. People mostly understand how a petrol engine works. But that doesn’t mean they are able to fix one or even make it. No, it is a long way to understand how things really work. And it is a psychologically proven fact that we can’t really understand things until we will try to change them. Well, don’t try it at home with your petrol engine. This time we will take a closer look on one of often omitted interfaces. You don’t need it in order to understand the general idea of IMS but when we go into a detail it can be very important. The Sh interface is defined by 3GPP in TS 29.329 as a diameter interface between an AS and HSS. The UE must implement the roles of an SM-over-IP sender and an SM-over-IP receiver, the IMS core network must take the role of an IP-SM-GW. In other words, the VoLTE network has to support the (legacy) SMS sent over SIP. The VoLTE phone will receive a common (binary) SMS and the native client will display this message as any other. The only difference is that this time the SMS is sent from an IMS network over SIP protocol. Mind the purpose is not just to support common text messages, but (more importantly) to support OTA messaging for (U)SIM provisioning, SMS ‘non-text’ applications or Message Waiting Indication for Voice Mail. 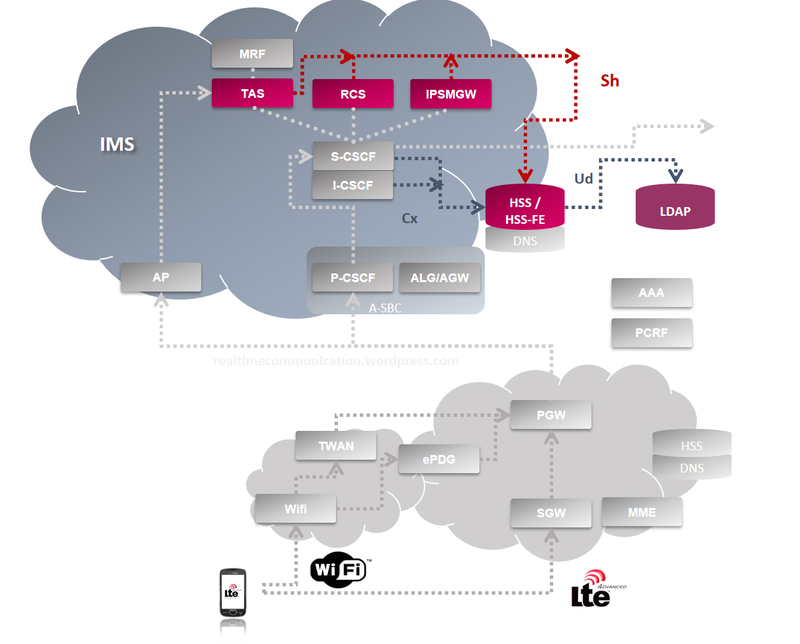 The network functionality which provides messaging service in the IMS network is called IP-SM Gateway (IP-SM-GW) and from the IMS point of view it is an Application Server. I know, I know – this is not really the Rich communication related stuff. However it is good to understand the roots of Instant messaging in 4G network. For us it is also important because of the IP-SM-GW Transport Level Interworking. Originally the core network elements supported services. SMS service was one of them and very important one. The application server is called SMSC. The main functionality of SMSC is to “Store-and-forward”. Basically the SMSC receives an SMS (MO-FWSM), stores it and acknowledges it back. Then it tries to deliver it. For that it needs to receive the routing information from HLR. If the delivery is not successful the message is scheduled for a retry. The routing of MT message is done based on the information received from HLR. So firstly based on the message prefix we will route Send-Routing-Information-request (SRI-req) to a responsible HLR. HLR takes a look in its tables and finds out what MSC is currently handling the recipient. The address (Global Title) is returned as Network-Node-Number (NNN). It is possible to return both MSC and SGSN address and the preference how to deliver the message. There some more operations as AlertSC and RMDS which have to be supported. Alert-Service-Centre message is used to trigger the SMSC to deliver messages of previously Absent Subscribers. Report-SM-Delivery-Status is sent by SMSC to update the information about subscriber in HLR. Anyway both the architecture and the massage flows are much simpler than in case of IMS. The idea was simple. Instead of direct delivery to the recipient’s MSC, the SMSC of the originator (SMSC-A) will forward the message to the recipient’s SMSC (SMSC-B). SMSC-B will apply the services for the recipient and will try to deliver the Short Message. This should be done in a transactional mode and the SMSC-A is still responsible for the retries. That’s because the SMSC-A needs to know the delivery result. Hence it can generate the notification ‘delivered/deleted’. Note, that the SMSC-B acts – from the SMSC-A point of view – as both, HLR and MSC. That means that the GT of SMSC-B has to be preconfigured for SRIs on the SMSC-A. Btw. The homerouting can introduce very nice loops in the network (which some operators intentionally misused ;)). Not all the operators use this call flow. Also mainly in the North America mobile operators prefer SMPP protocol instead of Sigtran in case of transfer between networks (SMSC-A to SMSC-B). 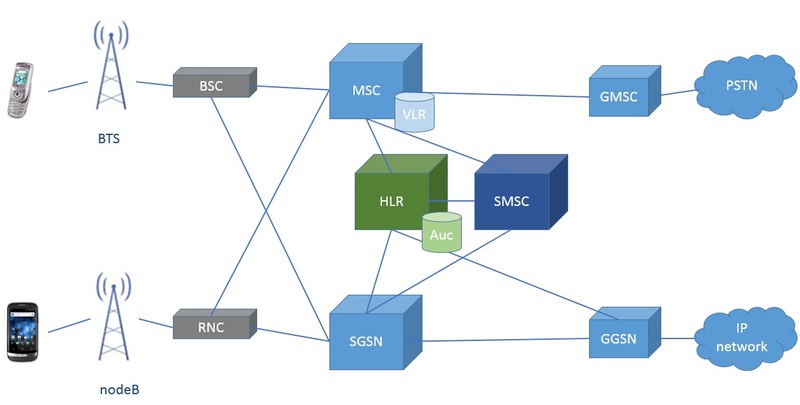 In the 4G of networks we reuse the homerouting scenario and the role of SMSC-B is played by IP-SM-GW. Registration is something what was missing in the times of wires. Ok, not completely but it was done more or less once when an MSISDN was assigned to some line. In contrast to the previous types of the networks the 4G network is ‘user-centric’. It means the user can use multiple devices and identities and we have to deal with it. The main purpose of the registration is to create a binding between user (her public identity) and IP address of the device, so we know where we can send the data to. That’s why there is a Contact header in the SIP REGISTER message. The Contact header contains an address which identifies the current location of the user (Point-of-Presence – e.g. IP/FQDN of a particular client). During the registration is the Contact Address is linked to a Public Identity (IMPU, AOR in SIP terminology). 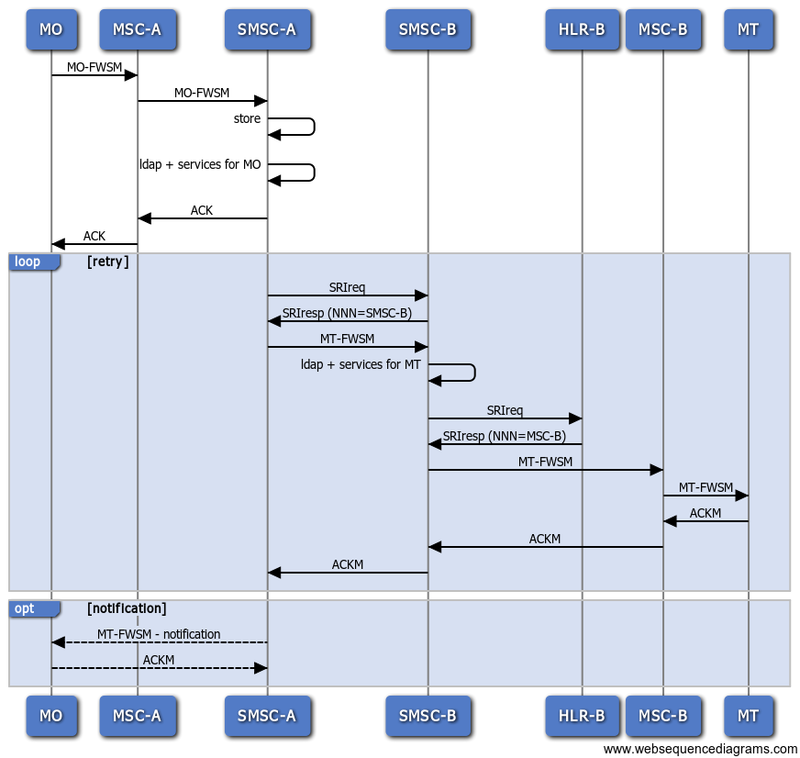 The IMPU is an equivalent to MSISDN in GSM and has to be present in the To header of the SIP REGISTER. One identity can by used by more terminals and as each terminal can have different capabilities this has to be also taken into account. This information is part of the Contact header. Instant (multimedia) messaging is a key feature for RCS as it should replace SMS service. There are more types of messages which can be sent through the IMS network. For common Instant Messages we typically use Common Profile for Instant Messaging (CPIM). This format allows compatibility among various messaging technologies. Notifications are then sent as in Instant Message Disposition Notification (IMDN) format. Messages can be exchanged over SIP or MSRP protocol. Sometimes also http/ws is being used for transfer of rich content. Update: For the information about RCS Universal profile read the post GSMA Advanced Messaging – RCS Universal Profile. RCS 5.2 defines two basic types of messaging. They are the Session Mode Messaging which is based on SIP INVITE and MSRP session and the Pager Mode Messaging which is based on SIP Message. The RCS refers to OMA CPM which is considered to be an evolution of the SMS/MMS messaging services. Session mode does use SIP INVITE and SDP protocol to establish the session. Within the session MSRP protocol is used. This allows to split ones conversation into dialogs and use “..is typing” notifications. On the other hand more resources is needed. eSRVCC - Mind the coverage hole!